In "Before Mars" (Ace, 2018), a geologist arrives at a small Mars base after a lengthy journey, only to realize that things aren't as they seem. The base's AI is untrustworthy, the psychologist seems sinister, and the main characters finds a note to herself she has no memory of writing. In a world of perfectly immersive virtual reality, can she trust what she sees? Or did the long trip take a toll on her sanity? 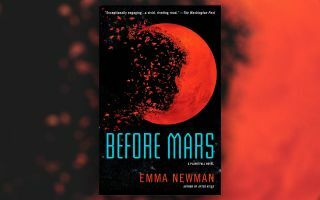 "Before Mars" is the third book set in Emma Newman's "Planetfall" universe, taking place on an eerie, largely empty Mars after a giant corporation buys the rights to the planet. Space.com caught up with Newman to talk about the new book, how it fits into the universe — you don't need to have read her other novels to follow along — and where Earth technology might be in 80 years. You can read an excerpt from "Before Mars" here. Emma Newman, author of "Planetfall," "After Atlas" and "Before Mars." Space.com: "Before Mars" is your third book set in the same universe as "Planetfall." What did you set out to explore this time around? Emma Newman: With "Before Mars," I knew I wanted to write a psychological thriller. I wanted the central question to be about two things, predominantly. One, when you see things and hear things that are strange, that don't fit, and you're terrified of having the same mental illness as your own father — whom do you believe, what do you believe? And tangential to that, I wanted to explore how human beings experience life in a world where they can record everything and have perfect playback in memory. All science fiction is writing about today, and one of the things that fascinates me about life today, right now, is how people are videoing everything and not necessarily being in the moment, and how that affects our processing of our own lives and our connection to our own lives and our own emotional state. When your own reckoner is the cam lens, when everything you see can be recorded instantly with full immersion, everything you see and hear, and you can replay it perfectly, does that affect how much you process reality [and how] you process memory? Those are the core things that I wanted to explore in "Before Mars." Another thing I wanted to do was to explore postnatal depression and to have a female character who's a mother who is not the usual mother that you see in a lot of media. I wanted to show that she could be a really good person and have many strengths and be awesome in many ways, but also be an absolutely terrible mother. It isn't necessarily her fault that she is, but she is. I wanted to kind of have that on the table, being talked about. Space.com: How did you develop the infrastructure for the book's Mars base? Newman: Funny enough, the article that helped things crystallize in my mind to write "Planetfall" also underpins some of the thinking behind the base in the Mars book. [The article] said, "Hey, wouldn't it be much more sensible to take 3D printers to the moon and just print it all out with moon dust?" If you have 3D printing technology to the extent that I do in my world, which is about 80 years in the future, then it makes perfect sense to just ship your printers out there, but, more than that, [to] ship the AI out there first. And that's something that I thought would just be sensible. If you have AI technology which is as good as it is in these books, it makes sense to me to have an AI go there [to gather data] before you go and send very squishy humans there who die really easily. Space.com: And what about the journey to Mars? Newman: It was an interesting question with "Before Mars," where I was thinking about how she gets to Mars itself and looking into the technology to take her there. I was thinking … the Pathfinder [spacecraft in "Planetfall"] has gone off to literally another solar system. Mars is just a sneeze and a bless-you away, compared to that. What is the big deal here? Well no, actually, the development of technology is really uneven in the real world, and it's uneven in my books as well. One genius developed [interstellar travel] and protected that information from people and locked it in a time capsule, [so] the world does not have access to her solution. Eighty years in the future, we're probably going to be able to go to Mars relatively easily, but it's still going to take a similar amount of time and it's still going to be in a not very comfortable spaceship. That's one of the things that I specifically put in the book, that it is not like what it is like in the computer games. You're in this craft where the majority of the space is taken up with stuff to keep you alive, whereas there's some bit of me, the child in me, that still wants it to be like the Enterprise and be nice, wide, spacious corridors and everything hidden behind nice, sleek panels. Space.com: You mentioned the technology shown in "Planetfall." Do you want people to read your three books in order? Newman: They are designed to be read in any order. My first proper series that was published was an urban-fantasy series with five books that has to be read in order, sequentially, otherwise the story really does not work. … It was such a stressful experience for so many reasons, but when I wrote sci-fi with "Planetfall," I just wanted it to be a self-contained book. Space.com: Although a traditional series gives you more time to develop characters deeply, right? Newman: Now that I'm writing the fourth stand-alone novel, there's a little bit of me that's going, "Hey, wouldn't it be cool to stay with this person?" There is that voice in the back of my head, which was not there when I was writing "Planetfall" and "After Atlas" and most of "Before Mars," I must admit. And it's been interesting going back to Carl [Moreno, the point-of-view character in "After Atlas,"] because Carl is a major character in this book, but he's a secondary character [as opposed to the narrator]. It's been really nice looking at the impact of what happened in "After Atlas" on him, albeit through another character's eyes. Saying that, I don't feel I've lost anything so far in the choice I've made with writing them all as stand-alones. I think because they're very tight first-person POV, we're in their heads all the time, we're … going so deep with each of the characters, that I'm not sure that there would be much more I would want to necessarily do. But I am delighted to revisit, so who knows what may happen? Space.com: What can you share about the next book? Newman: Book 4 does have some characters who are from the previous books, and it's completely set in space. I'm currently having my internal battle between what I like to talk about and what I don't like to talk about. The protagonist is Dee, who is Carl's best friend from "After Atlas." I'm really, really enjoying writing this book. She's a really, really interesting head to be in. That's as much as I can say. Space.com: Do you think humanity could ever actually move beyond the solar system, like in "Planetfall," to do some really long-distance travel? Newman: I think that all we need is the political and philanthropic will to make that happen. I genuinely do believe that. There's some genuinely interesting stuff that's happening in terms of propulsion technology which I was looking into for the book I'm currently writing, because in "Planetfall," it's backstory [about] how they get to the other planet, [but in Book 4], this is not backstory. This is happening now, this is the spaceship they are on now. When I write sci-fi, I like to know that it's correct. Anything that I put in there is as correct as I can make it. Space.com: Anything else you'd like people to know? Newman: I had this really interesting debate with a very good friend of mine who was helping me design the spaceship for Book 4. He's a naval engineer and designs warships, designs submarines, so he's a really good guy to have that conversation with. He was telling me about this amazing theoretical technology called droplet radiators, which can be used to deal with the excess heat generated by engines of the scale that I would need for this craft in Book 4. He made a comment saying, "Well, because you're going down the hard SF route, are you going to consider these things?" And I said, "Hang on a minute — I don't write hard SF." He argues [the "Planetfall" books] are [hard SF] because all of the technology is as legitimate as I could possibly make it, and it's extrapolated from correct science, and I don't put anything in that could not logically be created from the point we are today. There's no space-wizard stuff going on anywhere. But I was saying, my feelings about hard SF is that they're books where I get very, very, very excited about the scientific concepts, but I do not get excited about the characters. And that's kind of the opposite of the experience I want to create with my science fiction. I want it to be about the people first. For me, the joy of science fiction is the examination of the intersection between human beings and technology and how the latter affects the former. And he was arguing that you can still do that with hard SF. I would invite people to read it and decide for themselves. This interview has been edited for length. You can buy "Before Mars" on Amazon.com.